Create your own branded tap handle with a custom label! 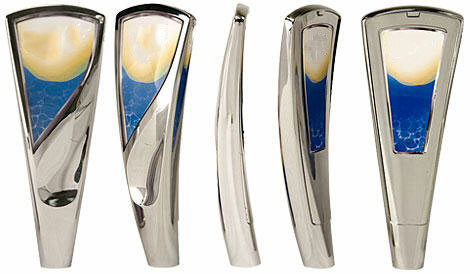 With its sculptured metal body the BOD tap handle delivers visual excitement in addition to space for branding. Comments: I just bought 2 Kegco K309SS-1 Full Size Digital Kegerators and added these Tap Handles to both. The handles look great but the only issue I had was creating a template to fit the margins in the tear-drop like Tap Handle window. By trial and error I finally managed to create a template to customize/print a new label when I change my kegs. 2) there should be a soft sponge (or something like that) inside to stop the plastic window from clattering. I made my own from an old sponge but that should have been included.